The original version of this article, by Emily Puckart, appeared on the Maternal Health Task Force blog. 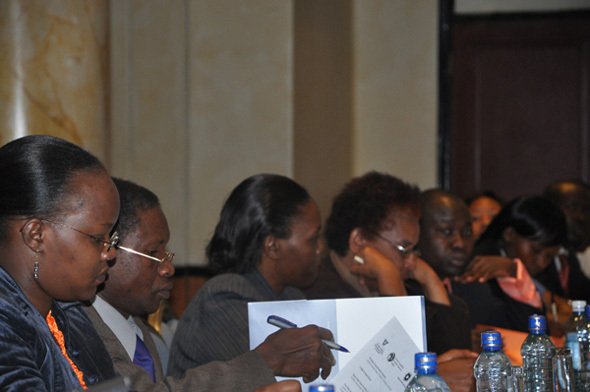 First, here in Nairobi, participants heard three presentations highlighting challenges in maternal health in Kenya. The first presentation by Lawrence Ikamari focused on the unique challenges faced by women in rural Kenya. Presently Kenya is still primarily a rural country where childbearing starts early and women have high fertility rates. A majority of rural births take place outside of health institutions, and overall rural women have less access to skilled birth attendants, medications, and medical facilities that can help save their lives and the lives of their babies in case of emergency. Catherine Kyobutungi highlighted the challenges of urban Kenyan women, many of whom deliver at home. When APHRC conducted research in this area, nearly 68 percent of surveyed women said it was not necessary to go to health facility. Poor road infrastructure and insecurity often prevented women from delivering in a facility. Women who went into labor at night often felt it is unsafe to leave their homes for a facility and risked their lives giving birth at home away from the support of skilled medical personnel and health facilities. As the urban population increases in the coming years, governments will need to expend more attention on the unique challenges women face in urban settings. Finally, Margaret Meme explored a human rights based approach to maternal health and called on policymakers, advocates, and donors to respect women’s right to live through pregnancies. Further, she urged increased attention on the role of men in maternal health by increasing the education and awareness of men in the area of sexual and reproductive health as well as maternal health. After these initial presentations, participants broke out into lively breakout groups to discuss these maternal health challenges in Kenya in detail. They reconvened in the afternoon in Nairobi to conduct a live video conference with a morning Washington, DC audience at the Woodrow Wilson Center. It was exciting to be involved in this format, watching as participants in Washington were able to ask questions live of the men and women involved in maternal health advocacy, research and programming directly on the ground in Kenya. It was clear the excitement existed on both sides of the Atlantic as participants in Nairobi were able to directly project their concerns and hopes for the future of maternal health in Kenya across the ocean through the use of video conferencing technology. There was a lot of excitement and energy in the room in Nairobi, and I think I sensed the same excitement through the television screen in DC. I hope that this type of simultaneous dialogue, across many time zones, directly linking maternal health advocates around the globe, is an example of what will become commonplace in the future of the maternal health field. Emily Puckart is a senior program assistant at the Maternal Health Task Force (MHTF).